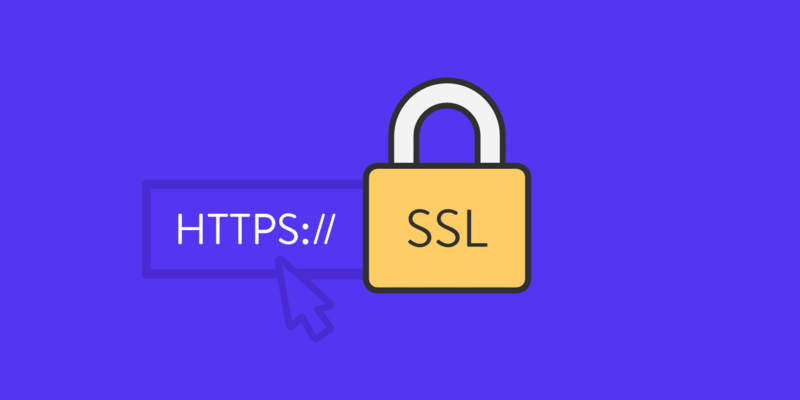 If you are running an ecommerce site, accepting credit cards, or passing information that needs to be encrypted, you’ll need to install an SSL certificate on your WordPress site. Having an SSL certificate will enable HTTPS and this ensures that no information is passed in plain text. In fact, we recommend all sites utilize HTTPS, as it has a lot of additional benefits beyond security. 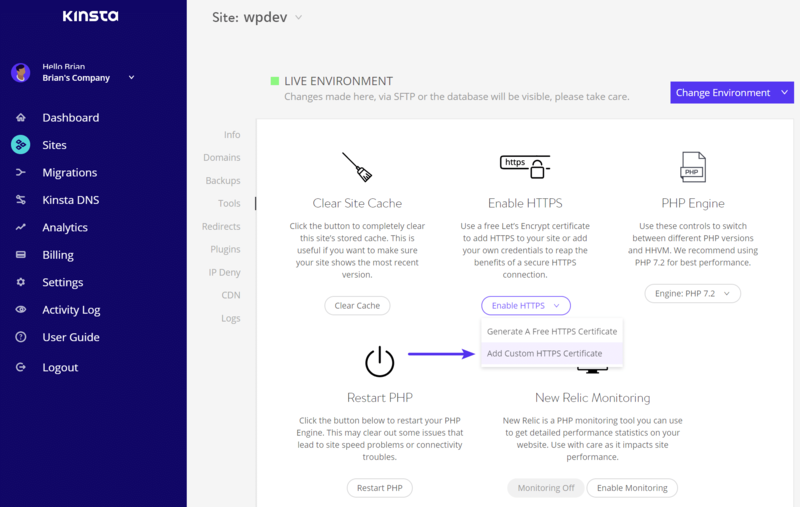 Follow the steps below on how to install SSL on your WordPress site. 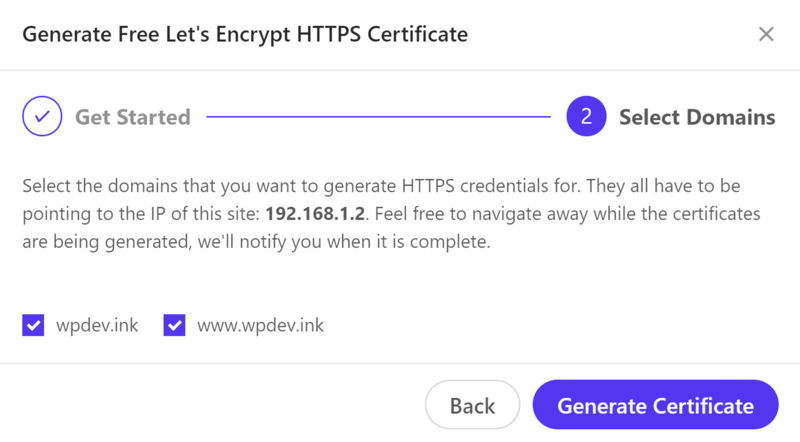 You have three different options when it comes to installing an SSL (TLS) certificate on your WordPress site. Also see information on checking your SSL certificate, renewing, and removal. Setting up SSL with our Let’s Encrypt integration is as easy as 123. Make sure your domain is pointed at Kinsta before proceeding. If you are using Cloudflare or Sucuri, skip down to Option 3. And that’s it! It will take a few seconds or so to install and your site should be all secured. Purchase your SSL certificate from any vendor you like such as Comodo, DigiCert, GeoTrust, Thawte, or Trustwave. 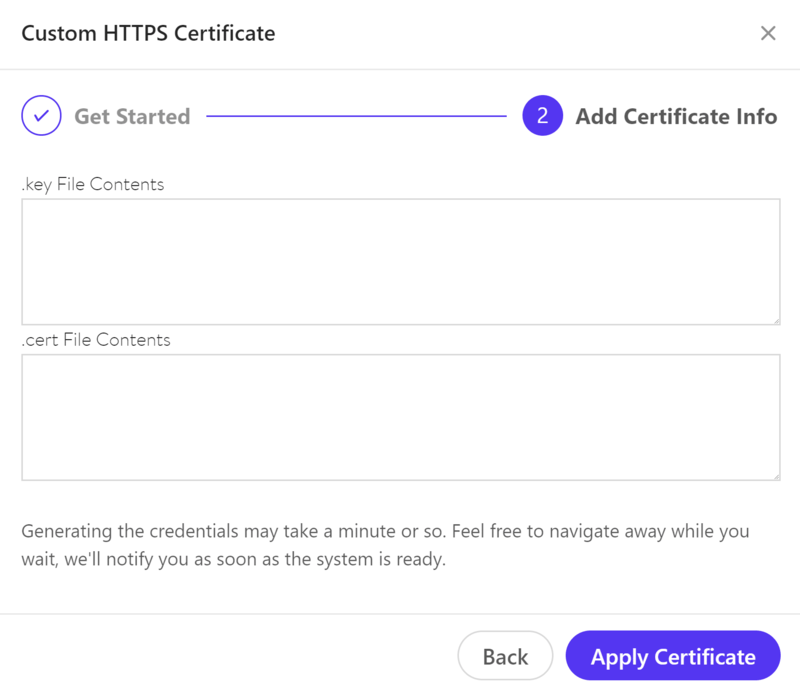 Kinsta supports all types of SSL certificates, including wildcard certificates. When purchasing a new SSL certificate, you are asked to provide the server type. The type of our web servers is Nginx, if that option is not available, then “Other” will work as well. A CSR code will be needed by the SSL provider to create/sign the certificate file. For generating a CSR code and RSA key, please complete the following form: https://www.ssl.com/online-csr-and-key-generator/. 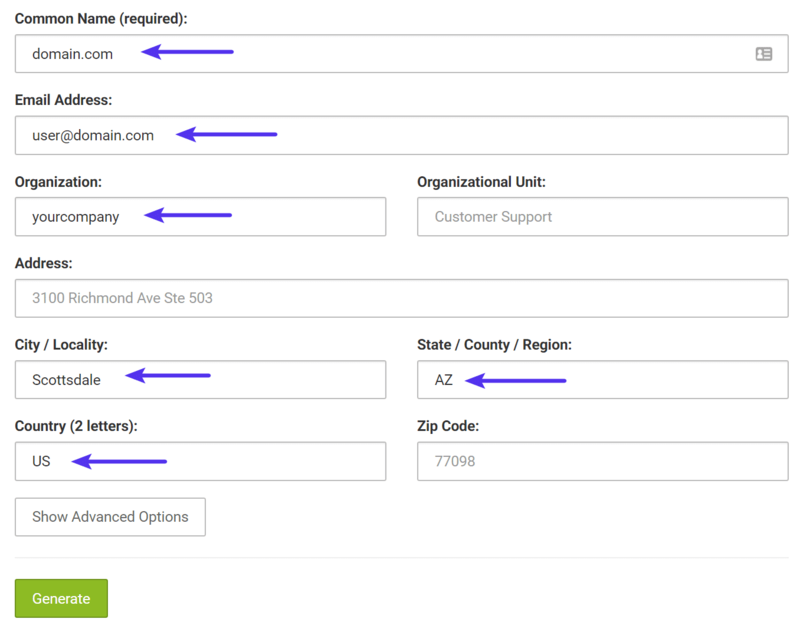 Note: For the common name field, if you are generating a wildcard certificate, you will need to input your domain name like *.domain.com. 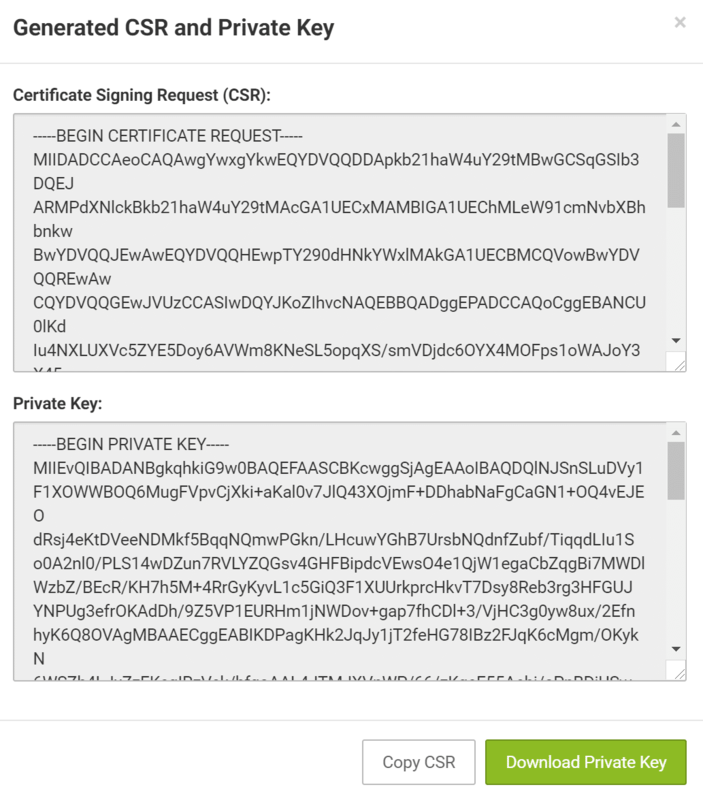 The form will generate you the private key file and the CSR. Make sure to save both of those as the certificate will be unusable without them. Upload your CSR with your SSL provider to regenerate your SSL certificate (.cert). Log in to the dashboard, click on a site, go to the Tools tab and click the “Add Custom HTTPS Credentials” button to get started. Cloudflare and Sucuri are what are known as reverse-proxy services. You can think of them as a middleman. You point your DNS to them, and in turn they route your requests to Kinsta’s servers. Because of this, there are a few additional steps you need to take to ensure SSL certificates are properly installed. Cloudflare allows two different arrangements for loading a site over HTTPS: flexible or full (or full strict). 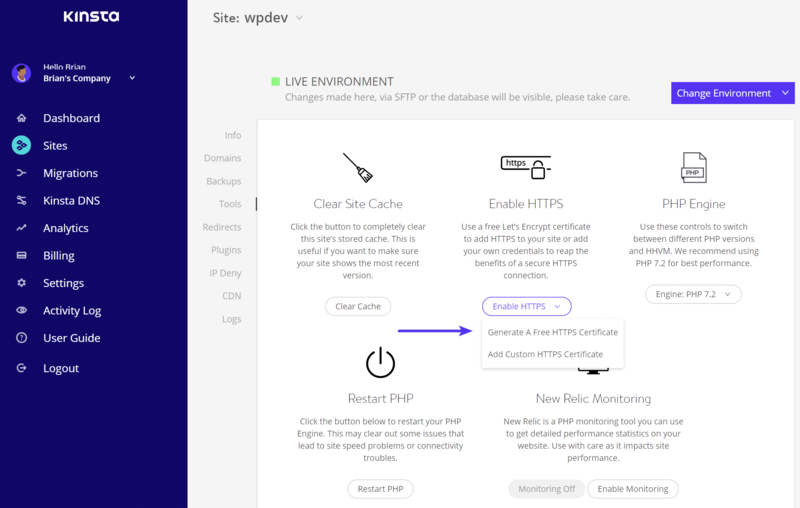 Flexible allows an HTTP (unencrypted) connection between Cloudflare and the Kinsta servers and does not require an SSL certificate. 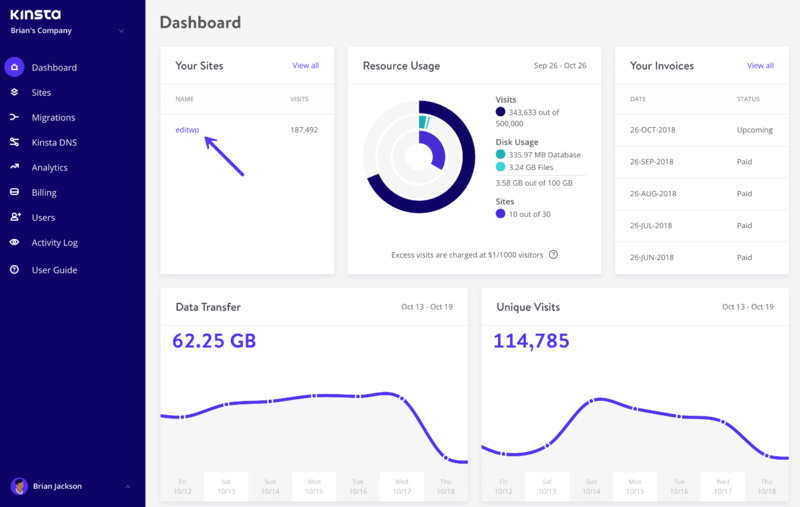 Full requires an HTTPS (encrypted) connection between Cloudflare and the Kinsta servers. 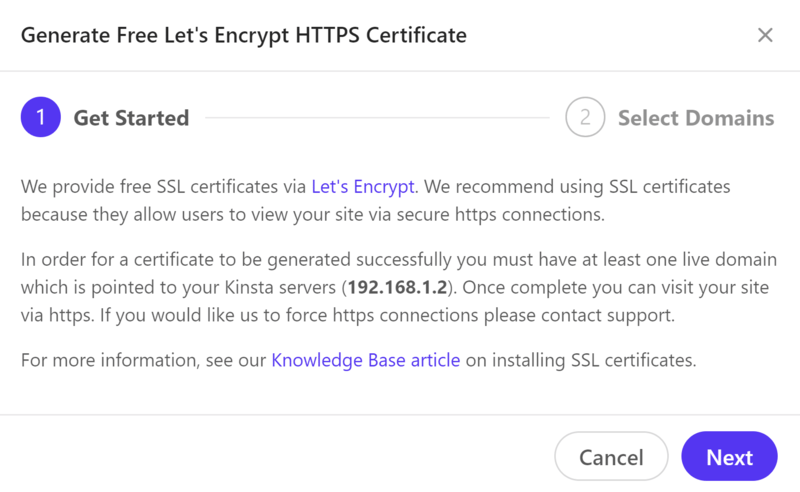 Install Let’s Encrypt or a custom SSL certificate at Kinsta via the methods above. 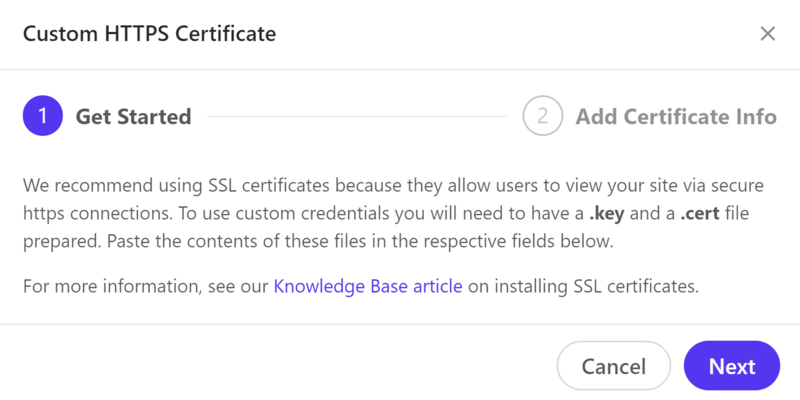 Once your SSL certificate has been successfully installed at Kinsta, set the crypto level at Cloudflare to Full or Full (Strict) so that the connection is encrypted all the way from the Kinsta server to the client’s browser. Then purge the Cloudflare cache. And if you put your site into development mode, make sure to set it back to active. You must first contact their support and have them enable the setting to “forward certificate validation.” This allows HTTPS provisioning to complete successfully. You may then install Let’s Encrypt or a custom SSL certificate via the methods above. After you have installed your SSL Certificate we recommend running an SSL check to verify that everything is setup correctly. Follow the information regarding renewal of your SSL certificate. Free SSL certificates (Let’s Encrypt) deployed via the MyKinsta dashboard are renewed automatically every 90 days. There’s nothing you need to do. 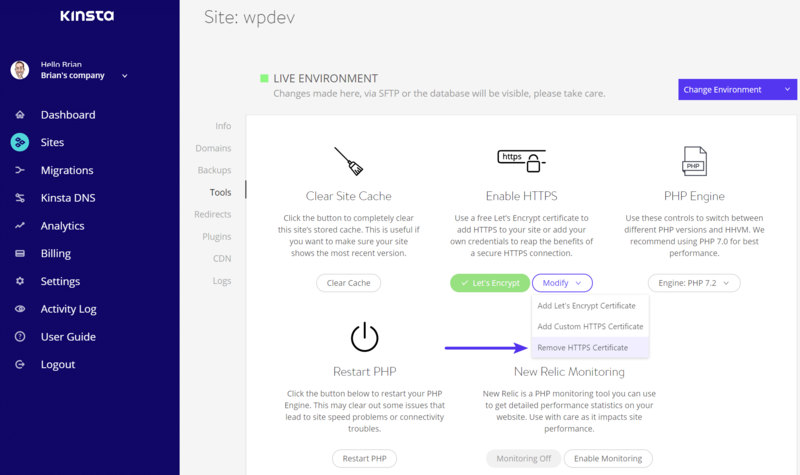 However, if your site is behind a reverse-proxy such as Sucuri, you must contact their support and have them enable the setting to “forward certificate validation” which allows HTTPS renewals to complete successfully. If you have a custom SSL certificate, you’ll need to renew it with the SSL provider or domain registrar from which it was purchased. As long as it was renewed before it expires, there’s no need to re-upload it to the MyKinsta dashboard. There might be some instances in which you need to remove an HTTPS certificate, whether it be Let’s Encrypt or your own custom SSL certificate. Perhaps you were testing an HTTPS migration or maybe you’re migrating your site to Let’s Encrypt certificates. To remove an HTTPS certificate, simply click on “Remove HTTPS Certificate” under Enable HTTPS in the Tools menu. → What Is Your Server Type for SSL? My SSL Provider Is Asking. → Do I need a Server Type, CSR Code, and RSA Key to Activate SSL?